Recently it was announced that Raiders of the Broken Planet is about to undergo a huge change into what will be known as Spacelords. Last month I got to visit the Headquarters of developers MercurySteam in Madrid. You can read about the sweeping changes of Raiders as it moves into Spacelords in my initial piece from that visit. 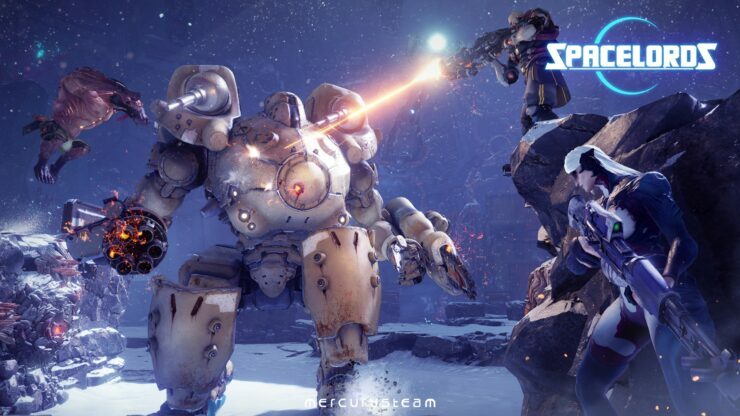 To begin with, I had the opportunity to talk to co-owner of MercurySteam and Game Director of Raiders of the Broken Planet – soon to be known as Spacelords. We spoke about Spacelords and the move from Raiders, as well as a number of varying topics – even to a potential move to Switch. Chris Wray: What exactly is going to happen with Raiders of the Broken Planet and the changes you’re planning? Enric Álvarez: So on August the 23rd, Raiders of the Broken Planet is reborn into Spacelords – a new free to play beginning for our online shooter. This is about what players want from us. As far as we’ve learned during the eleven months since we released the original Raiders campaign September last year. People want two things from any online game and specifically our game. They want us to consistently take care of the game and consistently improve the game, make new additions and add new stuff. Second, they want a huge community around the game. The Raiders veterans know we delivered in the first point but are still learning on the second one. Chris: What’s the driving force behind these changes? Enric: Back in September we hoped the low price point of 9.99 per campaign, which was the original model, was going to be very attractive to people. Quite cheap compared to the standards, especially for a game of this quality. We expected this would open the game for more players but, in all honesty, it didn’t work. When we realized this, maybe between the first and second campaign, we weren’t happy. We had two options at that point. Option one was to keep developing the campaigns we promised, take up the offer of a publisher to put all of the campaigns in a box and sell it as a premium product. The second option was the opposite, to go for a free to play model that keeps us in touch with and grow the game alongside the community. This is the option we chose and the free to play model we’re going to follow next month. Chris: Since you’ve known you wanted to make a change since then, why wait so long? Enric: This has two answers. The first is we had to deliver on our promise of making four campaigns. It was also a commitment to platform holders. Only one had been released and three more were in progress. This was one of the reasons we decided to keep moving forward. What was probably the most powerful reason was that we felt we had so much to learn, so we would be better learning it through the process of creating the campaigns – improving each and every one of them, all while we learn. Especially from a free to play point of view, we had a lot to learn about engaging, retaining and converting people. We also had a lot to learn about in-game monetisation. Chris: I think I know the answer to that. A rebranding is effectively a relaunch. It’s a new title for somebody to introduce themselves to, a way to get eyes to the game. Enric: You got it, exactly. You’ve said my answer. The amount of changes, in philosophy, in model, gameplay, polish, everything. It’s so massive between what we launched last September and this thing. The best way to communicate that this is something new is to put it in a new box. We had the option of either telling people that this is raiders but this is a list of all the changes. The shortest way to tell people to have a look at this, this is new, is to rebrand it. We feel that this is going to be controversial, so we want to openly explain it and not hide from it. Chris: So what exactly is Spacelords? Enric: As a title, Raiders of the Broken Planet felt a little short to cover everything that goes on from a narrative perspective. This is a game about one simple thing. Are you familiar with Dune and the spice? Enric: So Arrakis is the planet where the spice is, and spice is the most powerful substance in the Dune universe. 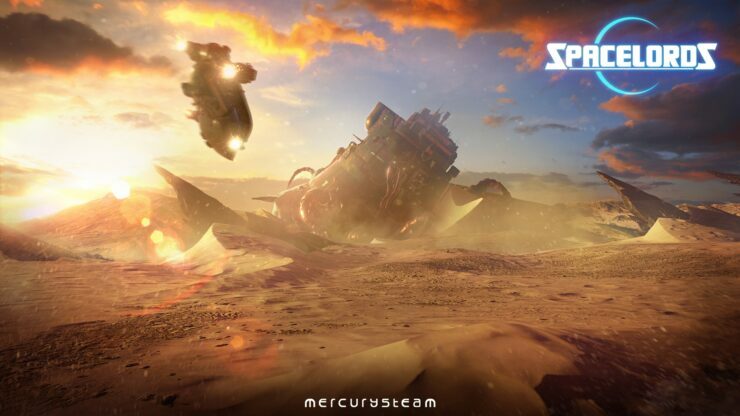 It’s the same thing here but instead of Arrakis we have the broken planet and instead of Spice we have Aleph. Aleph is a substance that can only be found on the broken planet and everybody wants. So there is a war going on between the raiders, the antagonist and a number of human invading factions there to take control of the planet. All of them want one single thing, to dominate the broken planet and have total control of the Aleph. They want to become Spacelords. The new brand now covers them all under the same umbrella instead of just Raiders of the Broken Planet which may not have totally represented the antagonists.